On May 12, 2010, in Bloomington, USA, the Dalai Lama, joined by a panel of select scholars, officially launched the Common Ground project, which he and HRH Prince Ghazi bin Muhammad of Jordan had planned over the course of several years of personal conversations. The project is based on the book ‘Common Ground between Islam and Buddhism’, which was commissioned by HRH Prince Ghazi bin Muhammad. It is hoped, with the publication of this work that the spiritual relationship between the two traditions will flower in many ways, including the promotion of a new realm of scholarship and research. The participants on the panel included Ingrid Mattson, Eboo Patel, and Reza Shah-Kazemi. 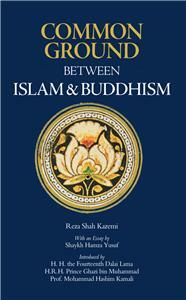 The specific intention and goal of this endeavor is to identify a spiritual ‘Common Ground’ (authentically based on the religious sacred texts of Islam and Buddhism) between Muslims and Buddhists that will enable both communities to love and respect each other not merely as human beings in general, but also as Muslims and Buddhists in particu­lar. In other words, we hope to find out and understand what in our two great religions — despite all of the many irreconcilable and unbridge­able doctrinal, theological, juridical and other differences that we do have between us and that we cannot and must not deny — we have in common that will enable us to practise more loving mercy and respect towards each other more because we are Muslims and Buddhists, and not simply because we are all human beings. In his foreword to the book, the Dalai Lama writes, “This is an important and pioneering book, which seeks to find common ground between the teachings of Islam and of Buddhism. It is my hope that on the basis of this common ground, followers of each tradition may come to appreciate the spiritual truths their different paths entail and from this develop a basis for respect for each others’ practice and beliefs. This may not have occurred very often before, because there has been so little opportunity for real understanding between these two great traditions. This book attempts to set that right.